As a nurse for almost 10 years, I have taken care of hundreds (maybe thousands!) of patients. Although I have left the patient bedside for a position in patient education, I still directly work with patients who have chronic conditions. Although I occasionally meet a patient who has an illness that throws me for a loop (for example, I recently met with a patient who had a condition that predisposed her to various types of cancer), there are several illnesses that I see frequently. Chronic obstructive pulmonary disease (COPD) is one of those conditions. My grandfather was recently diagnosed with COPD. As a very healthy older man, his diagnosis was a shock to both him and our entire family. He was a smoker, but quit over 50 years ago. We all couldn’t help but wonder, what did he do wrong? Did he even do anything wrong? The American Lung Association estimates that 85 to 90 percent of COPD cases are a direct cause of smoking cigarettes. However, there are a couple other factors that can cause COPD as well. As if we needed another reason to quit smoking — it can cause COPD. Most of us are familiar with symptomology of COPD and that breathing is affected. Obviously, breathing is necessary for sustaining human life. Quitting smoking is vital; it does not mean you will prevent yourself from getting COPD at some point, but it does decrease your risk. The American Lung Association notes that a burning cigarette contains over 7,000 chemicals. These chemicals contain toxins that contribute to COPD by weakening the immune system, destroying the alveoli, and narrowing air passages. 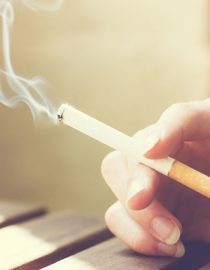 According to the Centers for Disease Control and Prevention (CDC), smoking accounts for eight out of 10 COPD-related deaths. This may mean a direct result of smoking cigarettes, but it could also mean a result of secondhand smoke — meaning if you are in proximity of secondhand smoke you are also at an increased risk of developing COPD. It is estimated that 25 percent of people who are diagnosed with COPD have never smoked a cigarette. These people may have been exposed to secondhand smoke or they may have been exposed to other toxins in their environment. The environment — whether at home or work — can play a big part in the health of our lungs. Air pollution, chemicals, dust, fumes, and certain cooking oils can all wreak havoc on the health of the lungs, predisposing us to COPD later on in life. It is important to note that asthma and COPD are two separate lung conditions. Often, asthma is developed in the early years — in fact, it is a leading childhood illness and affects 10 percent of the population, whereas COPD is a prevalent adult chronic disease and is the third leading cause of death. It is possible to have both COPD and asthma. However, it is also possible to have asthma as a child and for asthma to cause “remodeling” of the airways, thus causing COPD. In fact, children who have severe asthma are up to 32 times more likely to develop COPD in their adult years than a child without asthma. A COPD diagnosis gets puzzling when the person who is diagnosed has no smoking history or exposure and little to no exposure to any pollutants. An alpha-1 antitrypsin deficiency (AATD) may be suspected in this case. AATD is a genetic risk factor for emphysema. Those with this deficiency are thus at a greater risk for developing COPD. Although not terribly common, the World Health Organization and the American Thoracic Society recommend that every individual diagnosed with COPD be screened for AATD. There are people who have not smoked, have no exposure to pollutants and who test negative for AATD. For this reason, there is an ongoing study called the COPDGene™ Study which seeks to “…better classify COPD, and understand how the disease may differ from person to person. You might also like...How Does Air Quality Affect COPD Symptoms?